"He has no gift to give," they began to whisper among each other. "He has no gift to give the new prince." At last the sage came before the Caliph, and the room grew silent as all wished to hear what words he shared with their ruler. "Fine rainments, jewels and gold the prince has received, and may he be blessed by many more gifts as he grows to manhood. But, I bring the most precious gift of all. I bring the gift of "Stories." Laughter broke out in the room until the Caliph held up his hand to silence everyone and let the sage continue. "From the time that your son is able to understand my words," said the sage, "I will come to the palace every day and tell him stories. The tales I tell him, both true and fanciful, will make him wise and righteous as he grows in wisdom through my words. When the day comes, my Caliph, that you can rule no longer, your son will sit above your people as their chief. He will be just and merciful, and all of Arabia will rejoice in his leadership." Mehelled Abi kept his word. 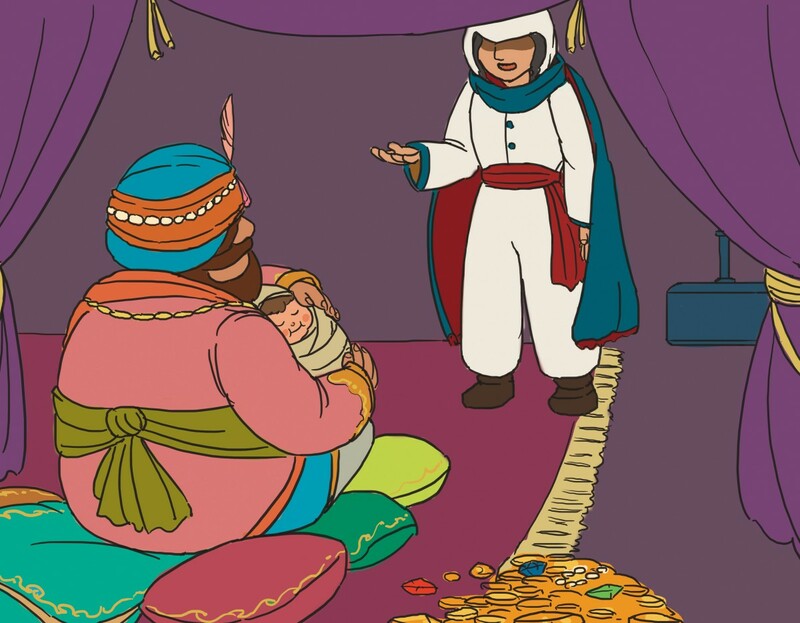 From the time the young prince could speak and understand words, the child, who was named Haroun-al-Rashid, was tutored daily by the wise old man and told stories from all around the world - tales both true and fanciful. He learned of wise men and fools of science and nature. He learned about all religions of the world and more. When the time came for him to rule as Caliph, he extended the borders of his empire from the Byzantine Empire in the West to China in the East. He ruled with wisdom like few other men possessed. Harun (called Aaron by westerners) is still known as "Aaron the Upright," "Aaron the Just, "Aaron the Rightly Guided. Baghdad grew in Power, in Art and Music. It flourished in the Art of Storytelling. It is said that the book, 1001 Arabian Nights was written during the reign of this Caliph because of the gift of stories.